First off dear reader I must apologize for the tardiness of this missive as I was delayed due to prior family engagements that ran much longer than expected. The topic that is grabbing most of the headlines is the “Debt Ceiling” solution. If you haven’t heard about this bit of Kabuki theater then you must be the neighbor of the guy in the “GEICO” commercial, who lives under a rock by the road, unaware that he can save money on his car insurance. All kidding aside the debt ceiling debate is more political show than true substance although they make it seem like more. The level of fear mongering seems to be rising by the day and it reminds me of those dark days in 2008 when then Treasury Secretary Paulson was depicted to have gotten down on his hands and knees begging Nancy Pelosi for “TARP” money. We all know how well the TARP package worked out and it stands as an example of how making decisions in a panic mode is never a good idea. Everyday there are more and more articles released about the minutia of the wrangling around the Debt Ceiling debate. As someone once said there are two things so disgusting that one is told never observe them being produced, the first is sausage and the second is legislation. Of course since this is a topic that I need to keep on top of I read every article that I can reporting on the Debt negotiations. The thing that strikes me is not the reporting or the two sides being so far apart on the method by which to resolve the problem, but instead the comments on each article. The comments section gives one an idea of where the public thinking is on the subject. As far as I can see the public is heavily divided and the comments reflect it. These comment sections degenerate in to the blame game where people from one political bent try to cast the opposite in a negative light blaming all of our woes on one party’s leaders or another, all of which is pointless to me. It is obvious to me that the general public, at least those that read articles on line are no longer adults but instead petulant children hell bent upon proving each other wrong. I say to all these people grow up as this infighting does nothing to move the dialogue forward nor does it get us any closer to solving our problems, whether on a message board or in the halls of Congress. If these people were in a fox hole during war time they would end up dead as they would not be able to work together and the enemy would come up and just shoot them as they argued. It doesn’t matter who did or spent what to get the US to this point but it does matter that we are not galvanizing to come up with a solution. I know we as a nation can come up with a solution for our problems if we would all put aside the past and look to the future. To paraphrase Winston Churchill’s famous quip, “Americans will try everything but the right solution first but will ultimately do the right thing.” The problem is that we are actually running out of time to do the right thing and I am not just talking about Turbo Timmy’s August 2nd ultimatum but instead the law of large numbers where the debts and other figures become mathematically insurmountable. Needless to say the debt ceiling and all the debates has an impact on the financial markets at least to some degree. With all the wrangling taking place and the appearance that there is a possibility of not coming to an agreement the markets have remained extremely calm. The common perception is that the two sides will hammer out a hodge podge proposal and the Government will be given an upward bump on their credit card to keep things going. I guess the question I have is what if those in Washington don’t do what the markets are anticipating? I believe that as the saying goes the stock market would become a market of stocks and many issues would decline where others would be much less affected and possibly even go up. If the US were to default you could see the stocks of those companies like Flir Systems (NASDAQ :FLIR) that derive a substantial portion of their earnings from the government decline. Additionally, a default would probably raise interest rates because investors would demand more compensation for the new risk associated with the formerly “riskless trade”. As a result of the rate rise stock sensitive to such things could get hurt as either their borrowing costs escalate or they are unable to get funding. The rise in rates would also kick the housing market in the teeth. While it would benefit savers in the form of increased yields it would decimate the baby boomers who have exited the stock market in droves and piled in to bond funds. Around the world US Treasuries are considered a safe haven and in past crises investors have run to the Dollar and treasuries. This time around when treasuries are the epicenter of the storm I don’t foresee the masses diving headlong into the very assets that are defaulting. Ironically the US Dollar would probably be a beneficiary of a debt default as there could be a demand for Dollars as other assets are sold. The synthetic spike in the Dollar would be short lived in my opinion as people would be looking for other areas to park their assets. When a country defaults on its debt its currency becomes suspect and people look to exit to greener pastures. The US Dollar is currently the reserve currency which has afforded the Government and the FED exceptional privilege in the past and I believe that may not be the case if there is a default. Reserve currency or not the Dollar is backed by the full faith and credit of the US Government in other words it is an IOU. How much is an IOU worth when the “ower” is in financial straits? Think of the down on his luck gambler who has exhausted their money and used up his “credit” lines. Is the House going to lend the gambler more or cut him off and force a payment? The same is true of the Dollar once “faith” is lost in the Government’s ability to back the Dollar. There are many that argue the Dollar cannot be supplanted because it is such a deep and liquid market and there is no single currency to replace it. I agree with that statement except in the circumstance where the Government has destroyed the confidence in its ability to deliver on monetary promises. In a world of US default , trading internationally would become more difficult as exchanges would have to be worked out between trading partners. A loss of confidence in the Dollar would hurt world GDP as it would force a decrease in trade velocity until a system of exchange could be implemented. I am pretty sure that the powers that be understand that a debt default would be inherently bad for both the US and the world and I have to believe that the Congress will pass something and at the very least raise the debt ceiling, albeit in the 11th hour. In the meantime there are at least 4 plans floating around 1) the Republican (cut, cap and balance), 2) The Coburn (Back in Black), 3) The Gang of Six plan and 4) Just get us to 2012(the kick the can plan or the McConnell/Reid plan). All the plans have inherent problems but I do believe that either a combination of elements or the “Gang of six” plan will make it through. While the “Gang of Six” plan is what appears to be in the lead it has issues and I don’t believe after reading the points that it will achieve anywhere near what is being touted. I believe that there are holes in the ideas big enough to drive a truck through, for example there is no real plan to come up with the initial $500 billion but it is up to each entity to review and propose cuts, I am sure dear reader that you can remember how well that worked when President Obama tired to get his own cabinet to find $100 million to cut. Additionally without any kind of amendment to force compliance in the future do you really believe that a future congress is going to be held hostage to today’s budget negotiations, I don’t. As many of you have read my articles here and on my own site I advocate ownership of precious metals along with stocks as assets you need to protect yourself in the financial landscape of today. The $64,000 question is what impact does debt and the debt ceiling debate has on stocks and precious metals. When congress passes the raise to the debt ceiling I believe you will see a rise in the general equities market as Wall Street will interpret the action as business as usual. Meanwhile I believe that the passage of the Debt Ceiling will cause a sell off initially in the precious metals markets and conversely a great buying opportunity. Regardless of what is passed I think ultimately it will be perceived as kicking the can down the road. The deficits will continue to grow even as the economy grows just not at a fast enough clip to meet the assumptions laid out in any of the deals. 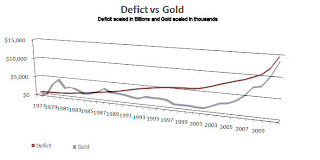 I also can foresee that as the deficit does not really get fixed but instead expands that gold and silver will continue to perform very well. Gold and silver are really the anti-debt and during periods of uncertainty and debt inflation especially coupled with negative real interest rates the metals perform very well. 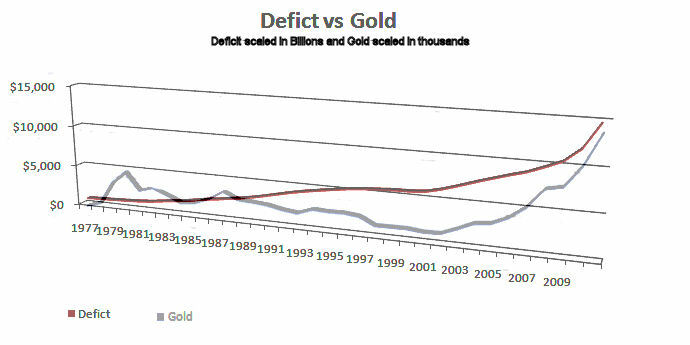 I am attaching a chart below that shows the rise in the deficit has fostered the rise in gold. As the events unfold and shake confidence in the FIAT regime the precious metals will grow stronger and tugged higher by the even larger debt. It really is the “the best laid plans of mice and men”. What I mean is that until something forces the US to deal with its issues and prioritize what is really needed we will not get our house in order. Just look at all the plans proposed they all make rosy assumptions that will reduce the debt by large amounts but are they based in reality. Think back dear reader to when Mr. Obama proposed a budget that would have had the deficits falling during his term. His budget predictions were predicated on high GDP growth, lower unemployment and reduced borrowing none of which came to pass so consequently neither did the reduction in the annual deficit. As Yogi Berra once said “predictions especially about the future are really difficult” and that is why I believe that regardless of what plan is adopted their assumptions are too rosy and they need to take a scalpel (or a chainsaw) to the budget or we will be having this conversation again in a few short months. The difference is in the future the conversation might be with a gun to congress’ temple. Until I see the move toward positive real interest rates and a credible plan to reduce the deficit not a delusion I will continue to hold my precious metals. We would be honored if we could republish the rss feed of MonetaAdvisors.com in our Financial Markets category. Our readers need to read what experts like you have to say.